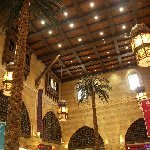 Dubai Mall is the world's largest shopping mall and counting all the things to do inside this shopping walhalla your head will start to spin as Dubai will show you what luxury can be. The Dubai Mall is not only the world's largest shopping mall but it's also part of the Burj Khalifa complex, the world's tallest building ever constructed. 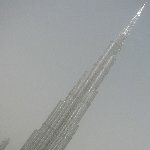 The Burj Khalifa was completed in October of 2009, a year after the finishing of the Dubai Mall. 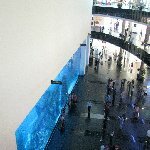 The Dubai Mall is not only home to all the stores you could think of but also includes an aquarium, an underwater zoo, a cinema, a hotel, a medical center and even an Ice Rink! 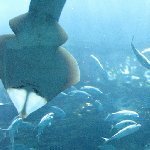 The Dubai Mall Acquarium is really amazing as it is built in the center of the shopping mall and as you watch across sharks and tropical fish you can look into the stores wich are located on the other side of the acquarium. Of course we made tons of pictures of almost everything as we couldn't believe how close this all came to a mall's perfection and of course the Dubai Mall's slogan sounds similar, perfection at your fingertops.. 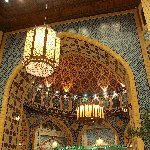 Speaking of which, there's no Starbucks as the one in the Dubai Mall as the taste is true Starbuck but the ambiance is incredible and while you're drinking your caramel latte you can't help gazing at the commercial mosque that has been built around you. 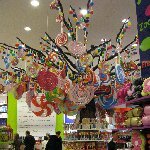 We just spend the whole day in the mall as you can imagine hours past by so quickly in between a movie at the Dubai Mall Cinema, some die hard shopping in the many stores and of course a ride at the Dubai Mall Ice Rink. I love Dubai! 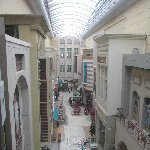 Did you enjoy Dubai Mall Pictures and have you been on a holiday in Dubai, United Arab Emirates? 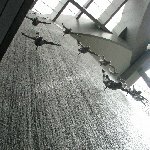 Where to stay in Dubai: Well, if you can afford it, the Dubai Mall Hotel to make your stay complete! Where to eat in Dubai: Starbucks for great muffins! !